Read Scott Morris's original post, "Multilateralism-lite from the Administration and Congress"
My colleague Scott Morris pointed out in a recent blog that the Global Fund to Fight AIDS, TB and Malaria will likely surpass the World Bank’s International Development Association (IDA) as the single largest foreign assistance contribution the United States makes to a multilateral institution. He described this move as “multilateralism-lite” – or a reliance on earmarking through multilateral channels by sector or country – and suggests this isn’t an optimal approach to poverty reduction and development. There are many points in this blog where Scott and I agree: the more multilateralism the better when it comes to US foreign assistance; and the US should have a more deliberate and transparent strategy for how it allocates funds within its foreign assistance budget. But the blog draws only brief attention to a key issue that I think puts this discussion in stark perspective and warrants a closer look: multilateral funding generally should be considered against bilateral funding. Indeed, with this point in mind, I think the broader issue may be less about multilateral versus “multilateral-lite”, and more about prioritization across the foreign assistance “budget pie”. Over the past decade, bilateral spending for global HIV/AIDS through the President’s Emergency Plan for AIDS Relief (PEPFAR) has quickly become the largest pot of US foreign assistance funding. The scale of PEPFAR is huge and historically unprecedented, and funding for the Global Fund – while growing – is still only a small portion of that. So what does this have to do with IDA? 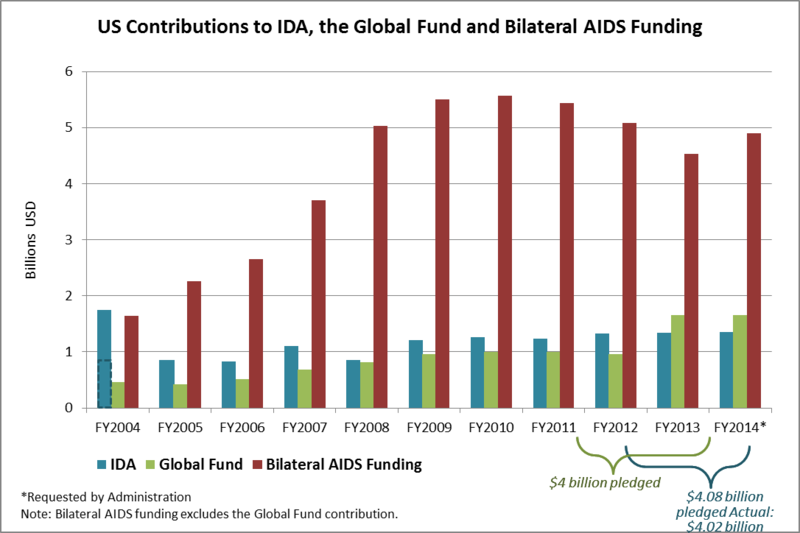 ; Simply, funding for the Global Fund may be surpassing IDA because health – and specifically AIDS – is where the United States has placed political and financial priority for the past decade. The reasons for this could be many: investments in health have shown huge and tangible results in relatively short periods of time; these successes are easy to communicate to policy makers and tax-payers in a powerful way; health and HIV/AIDS benefit from a strong (and loud) advocacy base. My point is not that this trend is good or bad, merited or unmerited. But simply that it exists. And it’s prominently reflected in the US budget and political rhetoric. The multilateral piece of the “health spending pie” is just finally catching up with the broader trend. 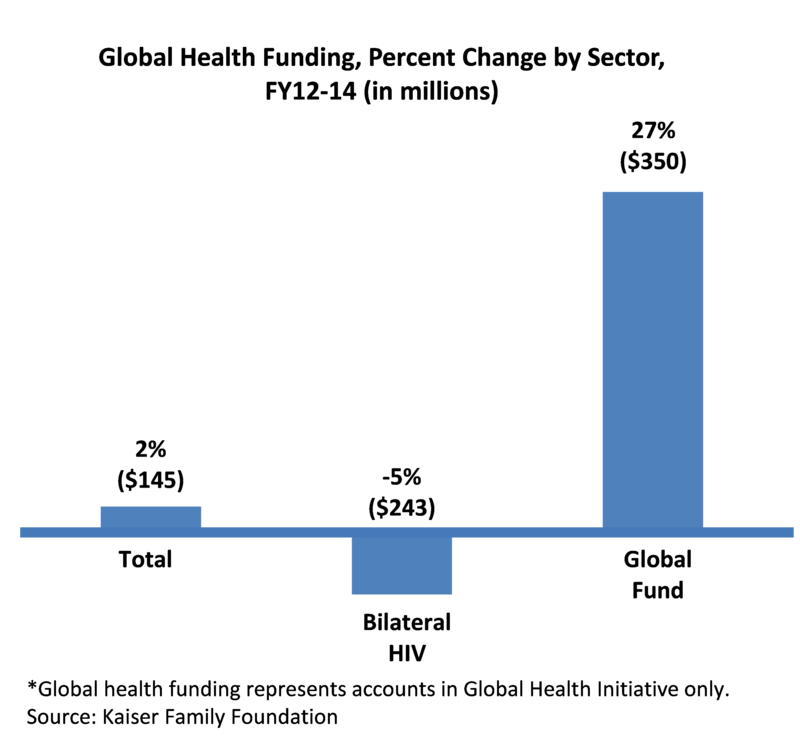 Indeed, in the past two years, the administration has shifted funds from PEPFAR to the Global Fund, resulting in a 27% increase to the Global Fund and a 5% decrease to PEPFAR (see chart below). As I’ve said before, it makes sense to gradually give the multilateral channels like the Global Fund a greater proportion of US resources for HIV treatment, subject to additional Global Fund reforms related to strengthened performance indicators and independent verification. This arrangement could leverage the Global Fund’s ability to give multi-year commitments to countries (an inherent limitation of US bilateral funding), and help ensure recipient countries are better protected from the ups and downs of volatile foreign assistance disbursements. So, where do these points leave the discussion? That’s the million-dollar question and food for endless thought. It raises big questions like whether US programs should be driven by local priorities or political salience at home (which I won’t try to tackle in this post). And some slightly more straightforward questions like whether there is a role in this space for IDA – to which I’d say yes! The Global Fund was set up in part because of a perception that ‘traditional’ multilaterals were not sufficiently nimble in providing the funds needed for a rapid response to address AIDS and other diseases. But now global AIDS funders are looking for ways to shift from an emergency response to a more long-term response to the epidemic that supports country ownership and sustainability. As lower middle-income countries increasingly self-finance their AIDS response, they might draw on IDA to accommodate that increased expenditure. This would be better for both the Global Fund and PEPFAR, as well as for country ownership and sustainability. It would also be a win-win for development and multilateralism in the long-run, even if not reflected in the FY14 budget. Maybe it’s some kind of spring fever, but CGD is in events overdrive in the next couple of weeks, spurred on by the World Bank / IMF Spring Meetings, and the plethora of discussions they bring. We are delighted to be pairing up with, and hosting, some big names, and so we thought it would be helpful to give you a handy guide to the insightful, provocative events that we will be holding. You may already have received invites to some of these events; if not, you can sign up here. The World Bank Is Turning 70. Do We Still Need It? The World Bank opened in 1946 to finance a global economy just emerging from colonization and warfare and just embarking on the Cold War. Today the global development landscape is radically different, and capital circles the globe at volumes unthinkable back then. Why keep the World Bank now?